We all know how important it is to look after our eye health, but did you know that you can boost yours simply by eating the right foods? Of course, you need to do everything else to look after your eyes, like wearing UV sunglasses and having regular eye tests, but on top of these, you can do yourself a huge favor with the help of superfoods. Firstly, have you ever heard of blue light? It’s part of the spectrum of everything we can see, and is on the shorter wavelength of higher frequency light, with red colors on the longer wavelength with a lower frequency. 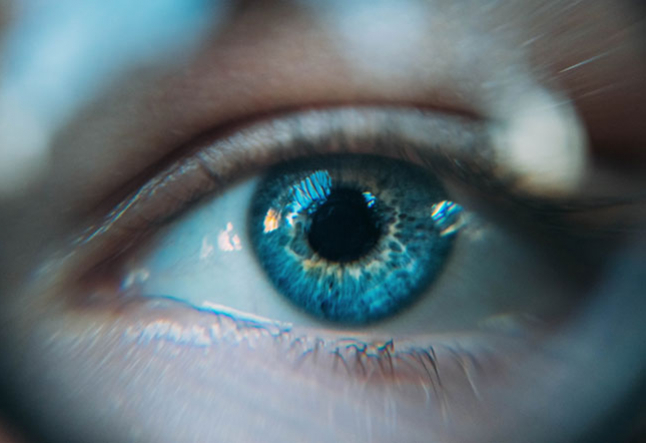 The higher frequency of the blue light means that it vibrates with more energy as it goes into your eyeball, meaning that it causes more damage to the delicate macula at the back of the eye. Now that we spend so much more time gazing at digital devices like smartphones, which generate blue light, our eyes are at more risk than ever. But help is at hand from the humble superfoods, thanks to the high amounts of two key nutrients they contain. A recent Harvard University study showed that, while 3 in 10 people over the age of 75 develop Age Related Macular Degeneration (a condition linked directly to exposure to blue light over time), the risk of developing the condition is dramatically reduced in those who eat a diet rich in lutein and zeaxanthin. In fact, those who consume these nutrients regularly were found to be 40% less likely to develop AMD. Now, lutein and zeaxanthin might sound like something you need a prescription for, but in fact, they're found in a host of easily accessible superfoods such as kale, spinach, peas, squash, and carrots. Now that you know all about blue light and the superfoods that combat its damaging effects, here are three simple and tasty recipes you can use to start fighting back for your eye health. This creamy pesto is nutty and best served over stringy pasta (or a gluten-free substitute). And it's made with kale, a super-green that's good for every part of you, not just your eyes. 1. Simply put the pine nuts, parmesan, garlic, oils, kale, and lemon in a food processor and turn it into a paste. 2. Cook some spaghetti or linguine and add the pesto and you’ve got a really quick and easy dose of eye-boosting kale and it tastes great. New potatoes are young, freshly dug potatoes, and when they are combined with bright, springy cress and beans, they make for a crisp, lutein and zeaxanthin-packed salad. 1. Boil the potatoes for 15 minutes. 2. Add the beans for the last four minutes then drain and cool. 3. Add the cress and the dressing of your choice and serve. Risotto is a hearty rice dish commonly found in Italian cuisine. This vegetarian-friendly recipe is earthy and bright, thanks to the mushrooms, a splash of white wine, and, of course, spinach, another eye health superfood. 1. Use a deep frying pan and heat the butter and oil. 2. Add the chopped onion and cook for 5 minutes, then the mushrooms and garlic for another 3 minutes. 3. Stir in the rice and then add the wine and cook for 3 minutes. 4. Reduce the heat and add the tomatoes along with 125ml of stock, then cook for 5 minutes. Then add another 125ml of stock and cook until it’s gone before adding the rest of the stock. 5. Flavor with the parsley and half of the parmesan then add the spinach and cook for 5 more minutes, adding the rest of the parmesan when ready to serve. It's important to take good care of your eyesight, even if you are lucky enough to have 20/20 vision. Fortunately, making sure you take in essential vitamins and minerals that are good for eye health is easy enough, especially if all it takes is a tasty meal.